Tire service is a fairly simple procedure that can be done anywhere. Tire service with a tire tube is a bit more complicated, but basically there is no big difference. We decided to put on a tire by ourselves. This required a protective tape on the rim, a tire tube and a tire for the wheel of 17 inches. We chose the classic sports model Michelen Pilot Power 120/70, that is is very popular with stunt riders, has good traction on wet and dry concrete, and does not require a long warm-up. Two tire fittings are enough for tire mounting, but we still bought rim covers so as not to damage it. 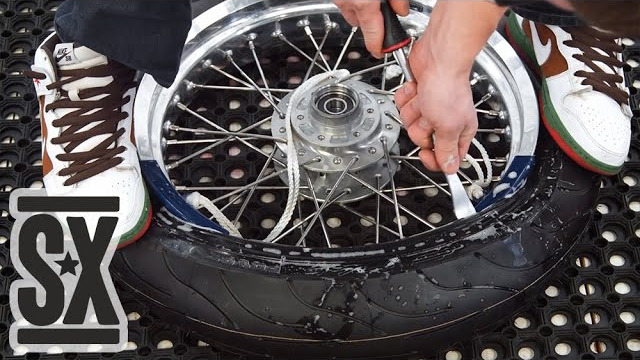 When mounting the tire with a tire tube, it is important not to "bite" the latter. The wide wheel allows the set the tire tube far from the rim, so this is not a problem. Before fixing the valve, it is better to slightly pump and flatten the camera so that it would straighten and the load on the valve would go lower. If that didn't work from the first time, flatten the tire and pump it one more time, instead of pumping it more than needed. Usually the tape and the tire tube are sold sprinkled with talcum powder so that the tube can be set freely without touching the rim when pumping. If not, it is better to sprinkle them with talcum powder or baby powder yourselves. Also on some tires there is a round red tag that must be matched with a valve. As a rule, there's no tag on the sports tires. To install the wheel on the KYB 43 mm fork, the side spacers from the LSL kit need to be shortened (the short one by 2 mm, the long one by 8 mm), and the outer diameter should be reduced to fit the glands (short to 28 mm, long to 45 mm). It is quite easy to assemble the front tire. After pumping, it is better to make sure that it is set evenly around the rim; there is an indicator strip for this. If the distance from the rim to the strip is not the same, then the wheels need to be flattened and re-inflated.